Description: Those older Huntsman remember fondly the poker games held at 11 Savile Row. 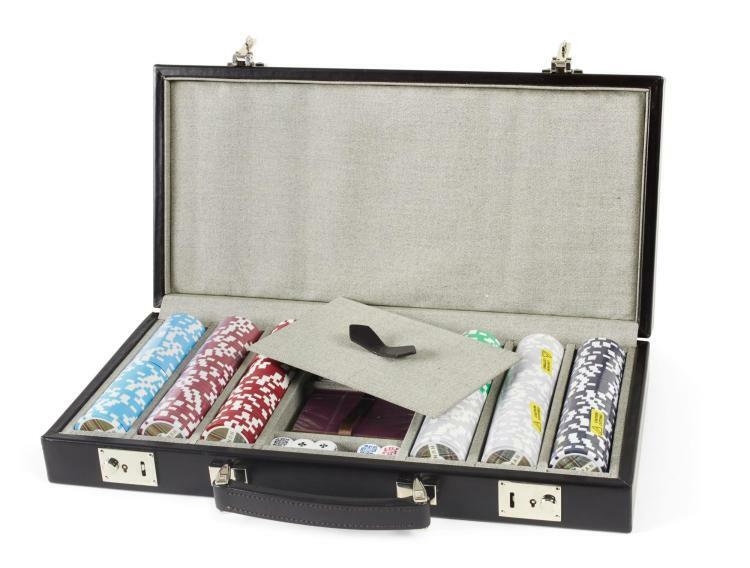 In homage to those precious moments, soon to be recreated in the Huntsman Lounge, this poker set with an exclusive Huntsman bespoke tweed print design and signature stag comprises 500 stag horn poker chips (Huntsman loves tweed everywhere), dice, and four packs of Huntsman playing cards featuring specially commissioned drawings representing kings, queens, jacks and jokers. The set is elegantly housed in a leather case custom made by Huntsman's partners at Simpson Leather, a brand dedicated to creating exquisite, enduring and functional leather goods, hand crafted in East London.